To make communication with our community even easier, West Valley School District developed a smartphone application. 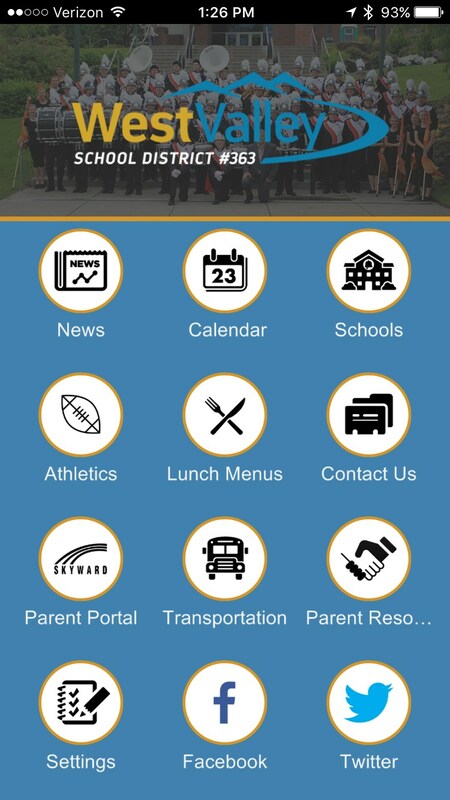 The app provides mobile access to district news, notifications, website and social media content, as well as access to the parent portal Skyward. This app provides easy, instant access to West Valley information. The app is available through the Apple Store for iPhone and Google Play for Android. Click on the appropriate link below to download the app on your smartphone. Easy Set-Up Once the app loads, use Set-Up or Settings to select what school(s) you would like to add to the app. Select Schools to find the mobile version of the school site you are interested in viewing and click on the individual school logo. Select the Website option to view pertinent school information. District-Wide announcements The WVSD app populates individual school pages with all-district announcements. If you have selected multiple schools to view, you may see duplicate announcements. For Apple users, click here to download in the iTunes Store. For Android users, click here to download in the Google Play Store.